Once homeowners have arrived at the decision to sell their property, most want the transaction completed as quickly as possible. Sure, you can hire the best agent in town, price your home just right, and then market the heck out of it, but having a little bit of luck on your side and a few selling superstitions never hurt either. When it comes to getting the deal done in a timely manner, sellers and agents have been known to rely on time-tested selling superstitions. Let’s take a look at 10 that are all but guaranteed to get that “Sold” sticker slapped on your “For Sale” sign in a hurry. Selling Superstition #1. Appeal to the senses. Here’s a sweet sellers superstition even if you’re not the least bit hungry, there’s something inherently appetizing about walking into a home and smelling a freshly-baked treat. While some experts recommend whipping up a batch of cookies, others say bread emits a scent that’s heartier, lasts longer, and offers greater olfactory appeal to buyers. Non-bakers will be glad to hear that sprinkling cinnamon inside a stove and turning it on low even for a few minutes will do the trick. Fans of savory versus sweet swear by roasting an onion, which is said to be enough to fool would-be buyers into envisioning hosting their very own Thanksgiving feasts in that home. Selling Superstition #2. 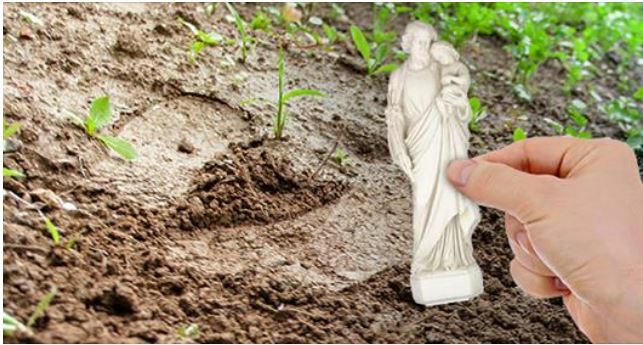 Bury a statue of St. Joseph in the yard. Though St. Joseph was a carpenter by trade, he’d have made a pretty great Realtor ®, some say. It’s believed that burying a statue of the saint upside down (because this way he’ll want to get out faster) seems to have a mythical ability to sell homes in record time according to some seller superstitions . Unlike costly home renovations made in the hope of a quick sale, this statue won’t blow your budget. Kits, which include an accompanying prayer, start at $6.95. Selling Superstition #3. Don’t do the math just yet. selling Superstition #4. A dimmer switch is a bright idea. Some believe putting lights in dining rooms, bedrooms, hallways, and family rooms on dimmers will attract buyers who are drawn to the control they offer but wouldn’t necessarily devote to the time or trouble to adding the feature themselves, but not completely sure of this selling superstition. Selling Superstition #5. Skip the zeros in superstitions. While it might be tempting to price a home at a nice even number, selling superstition dictates that you’d be much better off choosing a random figure as it lends intrigue. Just do yourself a favor, and leave unlucky “13” out of it. Selling Superstition #6. Throw in some amenities. Buyers often fall in love with certain features only to be turned off when they learn that the exquisite chandelier or state-of-the-art appliance they coveted is leaving with the homeowner. Consider sweetening the pot by offering up a highly-desirable item and watch the bids roll in with this selling superstition. Selling Superstition #7. Create a warm welcome. If the home boasts a fireplace, and weather permits, set it ablaze. A roaring fire adds warmth — literally. Creating a charming ambience will definitely distinguish one property from another in a buyer’s mind. Make sure fireplace is clean for this selling superstition as to avoid the nasty smell of burnt wood. Selling Superstition #8. Pretty it up with fresh flowers. Another over-looked selling superstition is when a home is showing, you want it to look as fresh and inviting as possible. Flowers go a long way toward adding color and character to any space — even a pint-sized powder room. This trick holds true for the outdoors as well. Good landscaping has been known to shorten a property’s time on the market by as much as six weeks, experts note. Selling Superstition #9. Don your lucky outfit. Lady’s will love this selling superstition,the right outfit can boost your confidence no doubt. Triplemint Sales Manager Joan Kagan says she owns a “lucky closings dress.” Hey, whatever works! Selling Superstition #10. Smudge it. Some believe a home may have a “negative energy” lurking inside, which of course, can cause it to linger on the market long after it should’ve been sold. Smudging, a Native American ritual, in which cedar and white sage are burned either together or separately. Next a prayer or intention is said requesting that only positive energy enter the space as the negative flows back out says this selling superstition. It’s said that strangers often feel these emotions more strongly than the home’s inhabitants. So the selling superstitions can mean tons to any potential home buyer or home seller and although some may believe, there may just be some truth to these. Lets discuss your selling superstitions and get your home sold for the most money possible!